Purple Rainbow Chews Life Soft Rosary | New! Chews Life Shop- Live, Love, Grow, and Create in the way God intended. Back in 2008 when I was pregnant with baby #4, life was BUSY and like most young families, money was tight ;) So pinching pennies meant I made a lot of the gift we gave! I made a few Nursing Bracelets for friends and they were a hit! After a little prompting, I opened my shop in July 2008 and sold my first bracelet within a few minutes!! My jewelry is by far my biggest seller! I'm proud to have my products in over a dozen shops around the nation, one shop in Thailand and one in Germany! I have also been featured on a few of the busiest deal a day sites for moms and babies :) It's exciting to watch my items sell out! To date, I have sold over 4000 pieces of jewelry! I specialize in creating unique and practical natural mothering accessories and necessities. I believe that all life should be celebrated! And it is my sincere hope that my products can help you do that! I love comments, questions, and custom orders!! So don't hesitate to contact me anytime! I'm here to help you. Catholic convert, wife to one, and mother to two beautiful children. God is good! All the time! 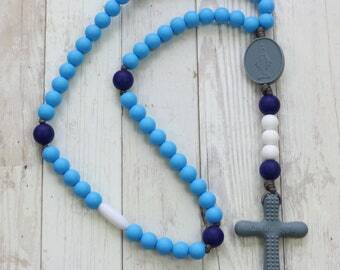 Chews Life creates beautiful, practical Rosaries and other devotional aids that foster love for Our Lord and His Mother, because we believe that a tribe of faithful Catholics praying the Rosary will change the world! Chews Life products carry a lifetime repair or replacement guarantee. In case of breakage or excessive wear, please discontinue use and contact hello [!at] chewslife.com for help. These Nursing Bracelets are a wonderful little tool that every foggy mama brain needs! Sorry Mamas, it's a fact, your brain shrinks with each baby! But don't stress, a Nursing Bracelet will help you take your little ones feeding schedule off your mind. These Nursing Bracelets work like a clock. Beads numbered 1-12 represent the hours of the day. Between each number on your Nursing Bracelet are 3 beads (some of my nursing bracelets listed have 2 beads in between), the spaces between the beads represent 15 min increments (or 20 mins for the 2 bead nursing bracelet). You simply place your nursing bracelet charm at the time to indicate the time you last fed your little one. Voila! No more note pad and pencil and no more second guessing yourself! Nursing Bracelets make great gifts for new moms! Nursing Bracelets can be used for bottle feeding and pumping Moms as well. Hope you enjoy your Nursing Bracelet and get as much use out of it as I do. If you have any questions about Nursing Bracelets, don't hesitate to ask!! If you receive your item and are less than satisfied, please let me know within 48hrs of receiving your package. My goal is your 100% satisfaction. You can exchange your item as long as you cover shipping both ways and the item is in brand new condition. Contact me at hello [!at] chewslife.com for more info. Paypal is the safest, quickest, easiest way to pay. Let me know if that doesn't work for you. Cancellation on custom orders are not generally allowed, unless there are extenuating circumstances-then it will be up to my discretion. I'm a busy mom with 6 busy little ones! So please be patient with me when it comes to shipping. Orders generally take about 1-2 weeks. Delivery Conf is included in the shipping price. Insurance is $2 extra and I encourage you to purchase it. Once the package leaves my hands, I can no longer be responsible for it. I usually ship 1st class and if you would like it upgraded to priority, let me know. International Customers: I ship 1st class international, which tends to be on the slow side, 7-14days. Also, there is no tracking available unless you'd like to upgrade to Express. I recommend that, but realize that it's not always economical.